"I never though much about the immortality part of being a vampire. Suddenly, forever feels like a really long time." This is the kind of episode that made me fall in love with this show. Nothing is as it seems. Around every corner is a new revelation. But every detail falls perfectly into its place. Seeing Dahlia's little trip down memory lane just reminds me that every character on this show has been a little twisted by at least one person or another. Esther abandoning her was heart-wrenching, but we already knew she was selfish so it wasn't all that shocking. I'm glad they had Dahlia admit that she wants power and didn't make her delusional about wishing for a family. Her offer was well thought out for the audience and the delivery was impeccable. I've got to say Dahlia is everything she was promised to be and more. I can't really wait to see what happens next if only because the deck is so formidably stacked. The most powerful vampire and the most powerful witch could take New Orleans to the ground and rebuild it without breaking a sweat. Trekking through the woods, Jackson's rising quickly in the rankings to the Marcel levels of annoying. It was mildly grating when he was bragging about being a rebel right before bragging about stepping up to lead the pack. No one likes a leader that toots his own horn. 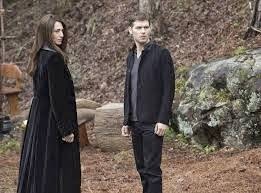 It was infuriating listening to him give Hayley an ultimatum between her pack and the Mikaelsons. Almost as annoying as her not telling him to go kick rocks. She's never let anyone tell her what to do. Why is she giving him all the power? Of course, it was probably more about taking some of her power back from the Mikaelsons and all the grief being tied to them has brought her. Even though Aiden is gone, he and Josh were still my favorite part of the episode. Poor, sweet Josh. He thought he finally had his happy ending. I'm glad he got to be a part of the funeral. Last week I commented on the similarities of Esther's plan to get Hope and Freya's plan to gain the trust of her siblings. They were both of the 'divide and conquer' variety. This week Esther tries to gain Klaus' trust by sharing the sad details of her life and how it makes her someone he can relate to. Freya's gone down that road a few times. Dahlia was smarter than Freya, though. She offered to give Klaus two things. One that he adores, his daughter, and one that he can't seem live without, revenge. Elijah was doing so well trying to think like his brother. Right up until he didn't stop Hayley from taking Hope. Oops. Also, I got a little satisfaction of seeing him put Freya in her place. You can't go around demanding beloved babies to use as bait and not go unchecked. 3 out of 4 dear john voicemails. This week in The Adventures of Cami's Counseling: Vincent, in the cemetery, with lattes in one hand and a magic spell in the other. I'm no art connoisseur, but the paintings Klaus made with Mikael's blood were hideous. I remember artist Klaus having talent. Now that Vincent has given them the spell to unlink Eva Sinclair's body from the lives of Davina and co. and given Davina a lead on how to bring Kol back, what excuse will they throw at us for Claire Holt not coming back? Can you feel that? I'm rolling my eyes. It's one of the pitfalls of the internet. We know she isn't coming back. The horse is dead. Stop beating it already. Dahlia: "We define ourselves by family. From birth, we share their names, entrust them to protect that which we hold most dear. We value them above all others and yet inevitably, we are forced apart. Promises are made, then left unkept." Elijah: "I would rather not release the Shakespearean rage." Hayley: "So after all that, Klaus didn't even kill Aiden?" Marcel: "Thought you'd want to know. Hayley: "Why would he take the blame?... Because he's stubborn and irresponsible on top of being a bloodthirsty lunatic." I really liked this episode, Dahlia is all I hoped for. She's a great and terrifying cold bloded villain! And Claudia Black plays her role extremely well! Is it just me or did Freya's accent disappear in this episode?